I finally got to making my own granola after concluding that the Nestlés and Kelloggs of the world weren’t even half as healthy as they proclaimed to be, and the ones that seemed genuine were priced exorbitantly. And so, I investigated and stumbled upon a couple of websites and had a go at it. 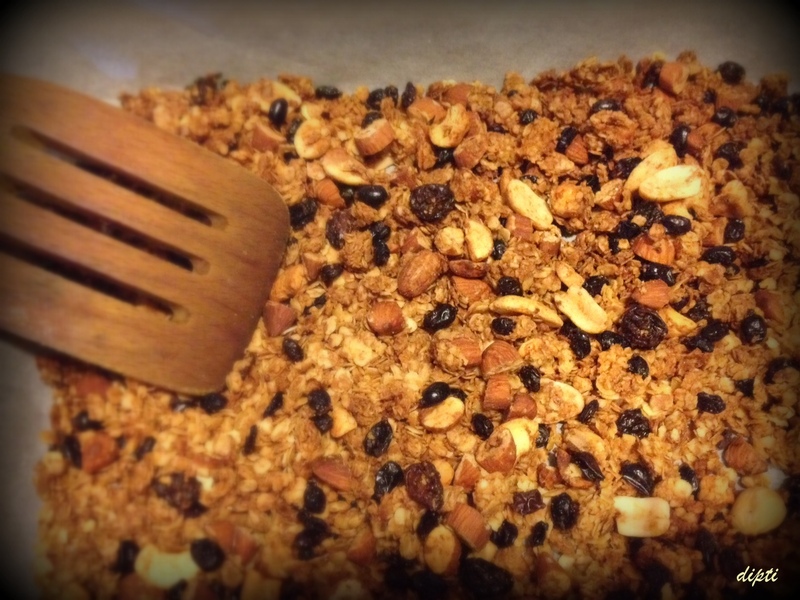 Result: Making your own granola is RIDICULOUSLY easy! So basically, I zeroed in on the Barefoot Contessa recipe and then did my own thing. That is, I reduced the amount of sugar (even replaced with honey a couple of times), didn’t have a stock of berries so added some lemon zest. I am citrus-crazy, in case you didn’t know. Give me a lime and I will eat the whole fruit without batting an eyelid! Slice into the whole thing and have a spoonful. Yumminess redefined.